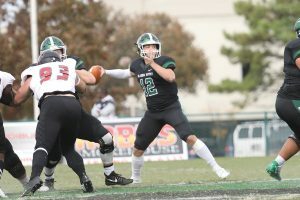 SHAWNEE—Following the best NCAA season in program history, four members of the Oklahoma Baptist University (OBU) football team earned all-league honors from the Great American Conference (GAC). Senior receiver Cagney Roberson was named First Team All-GAC after taking home second team honors in 2017. The Coweta native led OBU with 747 receiving yards on 65 catches for the season. He ranked third in the conference with 5.9 receptions per game, and fifth in the league with 67.9 receiving yards per game. Offensive lineman Brian Cornell, a senior from Allen, Texas, earned Second Team designation. 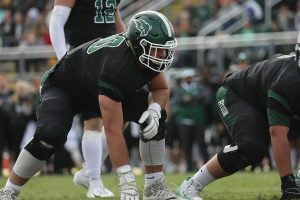 The Bison offensive line gave up just three sacks all season, the leading mark in Division II and the GAC. The dominant line play paved the way for the No. 1 passing offense in the league, averaging 276.5 yards per game. OBU also finished third in scoring offense (28.5 point per game) and fourth in total offense (391.9 yards per game). Receiving honorable mention recognition by the league were sophomore quarterback Preston Haire, and sophomore defensive lineman Robert Lolofie. Haire, from Trophy Club, Texas, continues to re-write the OBU record books as a passer, finishing the season with 3,034 yards through the air for a league-leading 275.8 yards per game. He also led the GAC in total offense, averaging 307 yards per game, while completing over 60 percent of his passes on the season. Lolofie, a Midwest City native, led the Bison defense with 5.5 tackles for loss and 4.5 sacks. 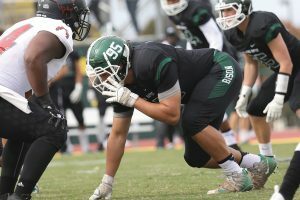 He also accounted for a team-high three quarterback hurries, and ranked sixth on the team with 40 total tackles on the year. 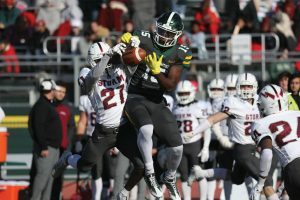 The Bison wrapped up the 2018 season on a three-game winning streak and compiled a perfect 5-0 record against fellow Oklahoma schools in the GAC.